It's been three years since U.S. Army Sgt. 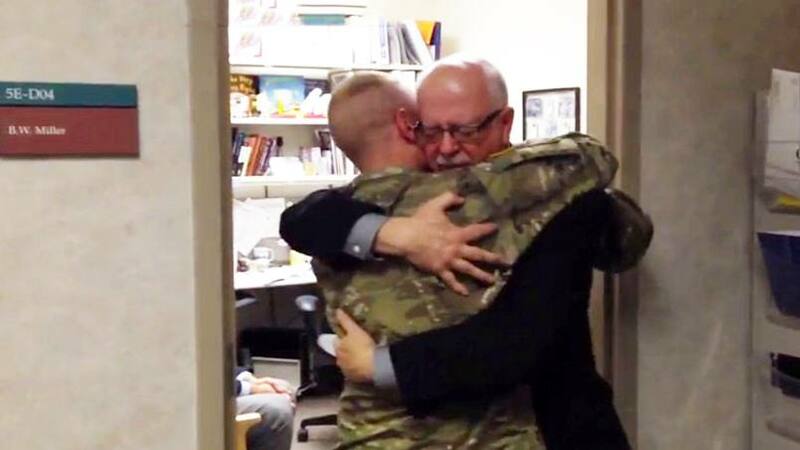 Mason Miller shocked his dad, Bernie, at work with a surprise homecoming. But their reunion, captured on video, continues to inspire. Bernie Miller has gotten used to a degree of celebrity. "Every once in a while I'll run into somebody in the elevator here at Mayo who will look at me and say, 'Hey! You're that guy from that video!'" Bernie tells us. "Even sometimes when I'm out in public, I'll have people look at me, do a double-take, and then ask me about it." "That video," it seems, has racked up 5.6 million views. Three years ago, Bernie's son, Mason, crashed a sales meeting in Bernie's office at the Center for Sleep Medicine at Mayo Clinic's Arizona campus after returning from a tour of duty in Afghanistan. Mason, we're told, had been covertly planning the "surprise" mission for three weeks with the help of a neighbor, who was also there to capture Bernie's reaction on video. "I opened the door and there he was. I'll tell ya, the tears didn't take too long to start flowing. It was a total surprise," Bernie told us at the time. "It was one of life's great experiences. No doubt about it." That neighbor and close family friend, Scott Kelley, posted the video on his personal blog. When that happened, the video racked up more than 60,000 views right out of the gate. Bernie, admittedly, has trouble wrapping his head around the 5.6 million views. "That's mind-boggling," he tells us. "It's absolutely crazy that that many people have seen it." It also caught the eyes of the folks putting together a TD Ameritrade television commercial that aired nationally on, appropriately enough, Father's Day. "Someone here at Mayo Clinic also saw it during the NHL playoffs," Bernie tells us. "It's pretty cool to see yourself on national TV and to have friends from back east call you and say they saw it, too." We were surprised to look up and see the Millers during a commercial break while cheering on one of the teams in black and gold during the Stanley Cup finals. Bernie hadn't seen the full ad until we played spoiler and sent him the video, but he says they knew it was coming. In fact, he and Mason had to go a little Hollywood and join the Screen Actors Guild to appear in the ad. Proud father that he is, Bernie tells us Mason continues to be "the big story" in all of this. "He got promoted to sergeant, so he's 'Sgt. Miller' now," Bernie says. "He's also doing his own internet radio show every Monday for the Heroes Media Group called 'The Arms Room.' On top of that, he's also working for a company called Independence Training, which does firearms training and a lot of corporate first-aid training. So he's got a lot going on right now." With more to come, it seems. "His reserve unit is also set to deploy again soon," Bernie tells us. "He can't tell me when or where, of course, but it'll probably happen sometime next year." Setting the stage, we hope, for another surprise homecoming. For which we, Bernie, and the internet, will be waiting. Until then, you can surprise us by sharing your comments below, and use the tools atop this page to share this story with others.